Window Handlebars give a custom style to your motorcycle and pair well with narrowglide front ends, as found on Harley-Davidson Sportsters and some Dyna models. The vertical uprights on the Window bars match the width of the 39mm narrowglide front end nicely. That being said, they look at home on H-Ds as well as Triumph, Honda and Yamaha xs650 choppers and customs. Biltwell handlebars are 0.120 wall (almost an eight of an inch thick), seamless 4130 chromoly steel tubing. The mandrel bending, precision mitering and beautiful TIG welding finish off these bars and ensure that they are top quality and high-strength. Dimpled versus Smooth Handlebars: What are dimpled handlebars? Dimples are indentations on the underside of each handlebar end and allow clearance for the switches on stock Harley-Davidson handlebar controls. The wire clusters on the stock H-D controls rest inside these dimples and are held in place by the bar clamps on stock brake and clutch levers. If you are instaling these handlebars on a Harley-Davidson and intend on keeping the stock hand controls and handlebar switches, dimpled bars are the way to go for a direct, bolt-on install. If you do not have bar-mounted eletrical switches or are running custom controls then you will want to use smooth handlebars. When in doubt, unbolt your motorcycle's controls and see if your stock handlebars have dimples or not. 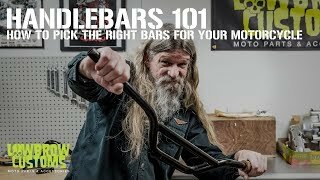 Get To Know Biltwell Inc.
would strongly recommend these bars!